I might be showing my Wisconsin roots by saying this, but I could eat this Mexican Corn and Bean Salad till “the cows come home”. For those of you who aren’t from the Midwest, that means it’s addictively delicious and difficult to resist. On top of that, this salad is fresh, healthy and full of bright, vibrant flavor. Definitely, a winner that you want to have in your recipe arsenal! I call this Mexican Corn and Bean Salad a “salad” but it’s really so much more than that. It makes a great salsa to serve with chips and can also serve as a relish to spoon over grilled chicken, salmon, shrimp or pork tenderloin. Sometimes I use it as a topping for tacos, quesadillas or burritos. See what I mean by versatile? Speaking of Austin and the fabulous food, I wanted to share one of our favorite, unique things about this beautiful capital city of Texas. Food trucks! Everywhere! I had no idea before our trip that Austin has the fastest-growing food truck industry in the country and the second highest number of food trucks per capita in the nation! In the eastern United States, where Scott and I reside, food trucks are mostly found circulating at special events and are more of a temporary anomaly than the norm. In Austin, most of the trucks are permanent and there are queues of hungry customers lined up from morning to evening. And the best part? The overwhelming majority of these pop-up restaurants serve fresh, fabulous, unique food! And believe it or not, these trucks represent just a snippet of the many we saw all over the city of Austin. But, back to the Mexican Corn and Bean Salad. It’s a wonderful recipe I adapted from Allrecipes. I couldn’t resist trying it after seeing all the 5-star reviews (over 1600!). I changed things up a bit but the salad combines a plethora of healthy ingredients; black beans, black-eyed peas, fresh (or canned) corn, crunchy cucumber, red onion, bell pepper and finely chopped cilantro. All these wonderful veggies are tied together with a vibrant, but simple, throw-it-all-in-a-jar-and-shake dressing which can be made ahead. You might get the idea that I’m super skilled with a knife, seeing all these finely diced veggies, but that’s not true. 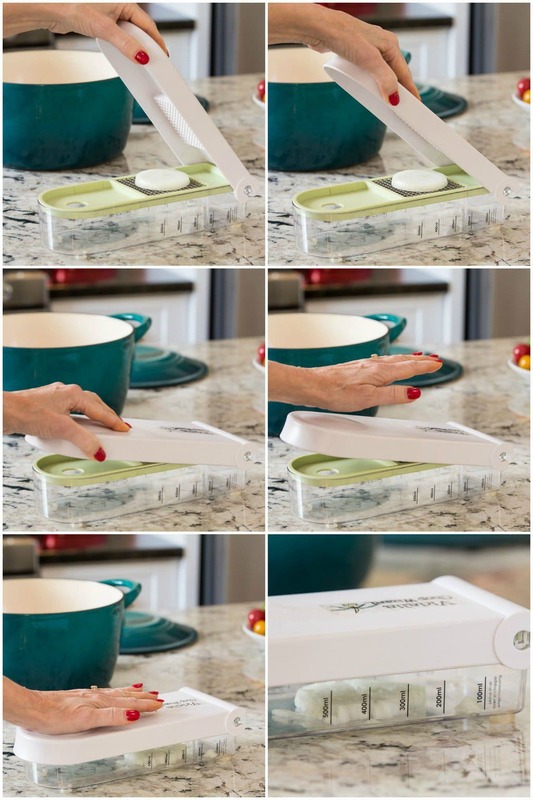 I use my Vidalia Chop Wizard to accomplish the task in a flash. I’ve been using one of these choppers for well over 5 years now and I would feel lost in the kitchen without it. Every couple of years I replace this little kitchen workhorse – I use it so often, the blade gets dull due to extreme Café use! However, it’s not an expensive tool and definitely pays for itself over and over in the amount of time it saves me. This salad only gets better as it sits and the flavors have a chance to mingle, so feel free to make it a day in advance. Just wait to add the cilantro until right before serving to keep the bright green hue. Don’t like cilantro? Use fresh basil instead. The salad will have a slightly different flavor profile, but will still be super delicious. If it’s not corn season or you can’t find sweet tender corn, use canned corn. But look for the tiny, sweet varieties that are available. I really like the Summer Crisp corn by Del Monte. You could also use frozen, but it won’t be as crisp. I used a red and a yellow bell pepper in this salad, for pretty eye-appeal, but any color (or colors) will work fine. Feel free to vary the amounts and ratio of veggies to your taste and to what’s in season. So, if you have a spring “event” coming up, a party, potluck or picnic, be sure to make this Mexican Corn and Bean Salad! But you might want to stash away a little bowl for yourself. 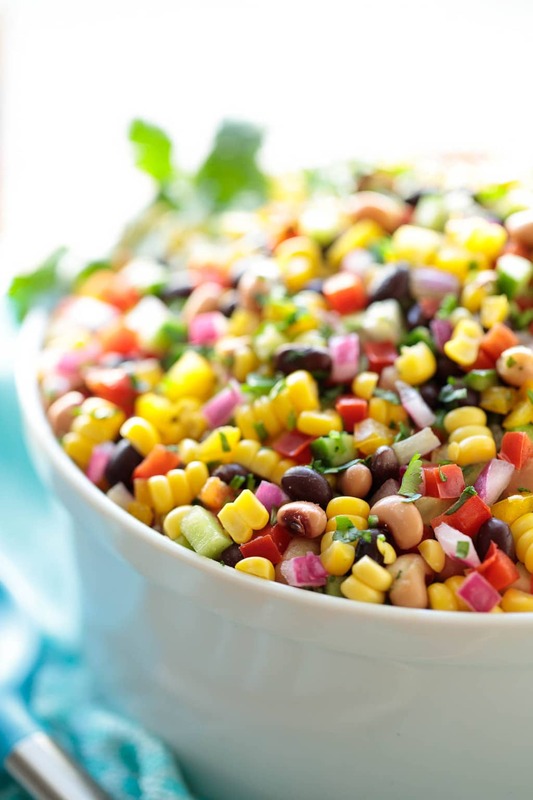 It’s pretty as a picture and with all the vibrantly hued veggies and delicious flavor, it will disappear as quickly as you can say “Mexican Corn and Bean Salad”! If you enjoy Mexican cuisine, be sure to check out our Homemade Flour Tortillas. They are, by far, the most popular recipe at The Café, having over 800 5-star reviews. Once you try them, I promise you’ll never want to buy tortillas again. And they cost a fraction of the price of store-bought tortillas – a total win-win! This Mexican Corn and Bean Salad is wonderful for potlucks, with chips and makes a fabulous side for sandwiches and grilled entreés too! If using fresh corn, place 3 unhusked ears in the microwave and cook on high power for 5 minutes. Allow to cool for 5 minutes, then cut 1 inch off the bottom of each ear. Starting at the top, peel off husks and silk. Check for any residual silk and remove. Cut kernels off of cobs and place in a large bowl. Repeat with the remaining 3 ears of corn. Discard husks. If using canned corn, drain well and transfer to a large serving bowl. Add beans, bell peppers, cucumber, corn, red onion and jalapeño to the bowl with the corn. Set aside. Combine all ingredients in a jar with a tight-fitting lid. Shake well. Pour half of the dressing over vegetable mixture in the bowl; stir well. Refrigerate for at least 1 hour. Taste and add extra dressing and seasoning (salt and pepper) as desired, to taste. See Café Tips for additional instructions and tips. Chris thanks again for such a colorful delicious recipe. It made a lovely accompaniment to the ribs we all enjoyed yesterday for Mother’s Day. My family thoroughly enjoyed it and I said I will give all the compliments to Chris but f Cafe’ Sucre Farine she is the terrific chef behind this flavorful salad. So my compliments to you for yet another lovely edition to my recipe box. Hi Chris, I’m looking for the quantity of servings in this recipe, but only find the 62 cal per serving. How many does this serve? I plan to serve this to 80 people, so I’ll need to do some math. Thanks, I love reading your blog. Hello Joyce, this will serve 12, with medium size servings. There is a little adjuster above the serving size that might help you. It doesn’t go up to 80 – I think just to 24. But then you could probably triple or quadruple the recipe and have plenty. Healthy, pretty and delicious. This is a winning combination! Such a vibrant and delicious salad – I love your perfectly chopped veggies! What a terrific dish! So full of flavor, and such vibrant color. Beautifully photographed, too. Thanks! Such a beautiful salad and so full of flavour! I would love a big bowl of this in my fridge to snack on all week 🙂 Hope you had a wonderful Easter! I adore all stuffs healthy. And this one here looks so nutritious, vibrant and gorgeous. Ticks all the marks for a perfect mexican bean salad. Thanks for this share. So beautiful, colourful, inviting ! Thank you and happy holidays! The recipe calls for 6 ears of fresh corn in ingredient list but in directions only mentioned pun s placing 3 ears of corn in microwave. What happened to the other 3 ears of corn. Thanks for noticing that Judy, I amended the recipe! I can vouch for the Midwest corn—nothing better! And I love using fresh off the cob corn in salads like yours! Can’t wait to give it a try!!! Austin is the food truck capital of the world for sure! Glad you had a good time and was inspired to put this beautiful recipe together. A must try this summer for a nice family get-together. Happy Easter Chris & Scott! Have a lovely weekend. Thanks, Tricia! Austin is such a fun place to visit! I’ve made this several times and so delicious. Lasts a few days in frig and great snack. I know Jackie, I can eat this any time of day! I love salads like this one Chris! Nothing but healthy things. Perfect to have in the fridge to snack on too!